Compatibility: Microsoft Windows. Intel Macs with Mac OS X 10.4.9. PowerPC Macs not supported. Leopard 10.5 and 10.5.1 not supported. Supported on Intel and PowerPC Mac OS X 10.5.3+ (You can check a blog about using the GPS-CS1 on a Mac, but so far no one has reported success on PowerPC or Leopard.) Various versions of Linux are also reported to work. Hardware: A simple, well-designed GPS receiver (with no display) and data logger, creates NMEA format GPS log files that you can download over USB. It is a completely self-contained unit - there is no Bluetooth or GPS mouse capability. 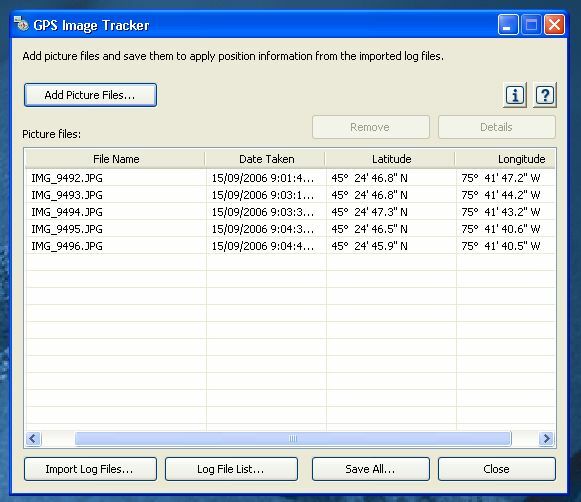 Software: GPS Image Tracker is a very basic and somewhat confusing version 1.0 Windows application that will match GPS tracks with photo times and stamp the location into the photo EXIF (geocode the photo). It does not require photos from a Sony camera. Conclusion: This device does a great job of easily and automatically recording your location, for later use in geocoding photos (or any other application where a GPS track would be useful). You may, however, want to use a different software package to do the actual photo geocoding; the software provided with the unit is incredibly basic. Note: I did not evaluate the additional software for Sony cameras, as I don't have one. You can purchase the Sony GPS-CS1 immediately. I got mine in Canada from SonyStyle.ca for C$130. One place it's available online in the USA is Amazon.com - Sony GPS Unit For Sony Digital Still Cameras (note that they don't ship electronics outside of the States). In other areas, check your Sony stores as well as camera and electronics stores. The unit is smaller than I expected. What's in the package? (battery and pen not included - shown for comparison purposes). Takes one AA battery, which it says will last for 10 hours (alcaline). The carabiner is a good idea but I am a bit concerned about the implementation - I'm always sceptical of the strength of plastic. You can either use the detachable string part, or you could connect it directly to the ring below the carabiner - neither look particularly sturdy to me. I'd be more including to just run a small carabiner itself through the attachment point at the top of the GPS. Also, having it hanging off your belt loop may seem like a handy idea, but in practice this means it bangs on your leg with every single step - off of a backpack would be a better choice. There are three LEDs and two buttons - GPS LED shows whether you have a location fix, battery lamp (steady green is good, flashing red means below 20% battery power remaining), MEM full LED shows you when you have filled all 31 MB of the device. Power button and a Clear button, both designed so they can't be activated accidentally. Software install was as basic as you could get - one choice is the GPS Image Tracker application, the other is Sony Picture Utility Update Program, but the latter only works if you have pre-existing Sony camera software. Note: This is not a Bluetooth unit, nor does it provide live serial GPS data - you can only download the log after the fact to find out where you were, you couldn't use this device e.g. for live car navigation - there is no display of your current location, and you have to download the file. Let's walk through GPS Image Tracker. As you can see, it's version 1 software. Or version 1.0000 software, to be more precise. The software asks for your timezone, I found this very confusing, due to Daylight Savings Time. Does it want to know my permanent timezone (GMT-5)? Or the current timezone, which is GMT-4? The answer is, the current timezone, with any DST adjustments included (so I changed the dialog box shown below to GMT-4). I also unchecked "Delete all log files". The photos are automatically matched with any GPS logs it finds, as they are loaded. Any images that support EXIF 2.1, with time stamp info, are fine; it doesn't have to be Sony camera photos. In the example below, I am using images from my Canon PowerShot S70. Now, all that remains is to Save All... of the photos, at which point the location information will be added the photo metadata, the EXIF. Once this is done, any application that reads the EXIF (such as Flickr) will automatically be able to map the photo. It next asks you if you want to update the EXIF, or save separate copies of the photos. I chose to replace the photos with the updated ones. At this point, I'm not sure what happens if you have Sony images. If you do not, it gets VERY confusing. As I mentioned, I am using photos from my Canon S70. 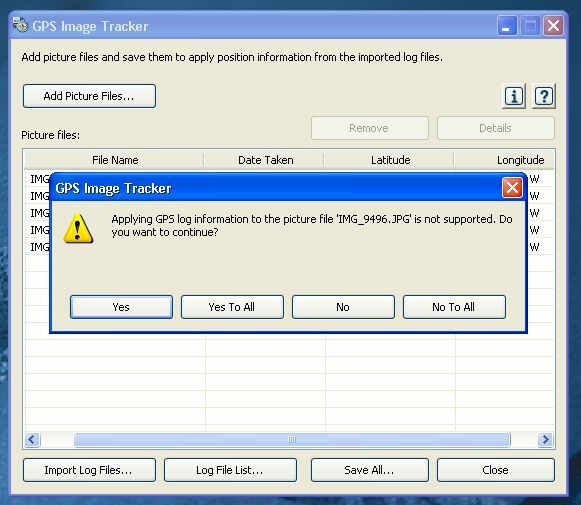 It said "Applying GPS information to the photo [photoname] is not supported. Do you want to continue?" At that point, I was quite disheartened. But it turned out, if you say yes, it will stamp the location to the photo EXIF. So when it says "do you want to continue", really it means "do you want me to try to update the photo EXIF anyway". I have uploaded three photos that I geocoded using this software, they're in my Flickr set Sony Geocoded. How good is the location match? Have a look at the map. Not bad. The first one is pretty much exact. The second two are off by a few metres. If you want 1 metre accuracy, you're going to be disappointed with most any GPS I would expect. As long as you consider +/- 15 metres or so "good enough", you'll be pleased. In the photo below, I have indicated with arrows and green dots where the second two photos were actually taken - keep in mind this may also be a slight registration issue with Yahoo Maps - it's hard to get everything to line up accurately on the scale of meters. In my previous posting I had posed some questions, now I have some answers. 1. Do you have to buy the GPS-CS1 to get "GPS Image Tracker"? 2. 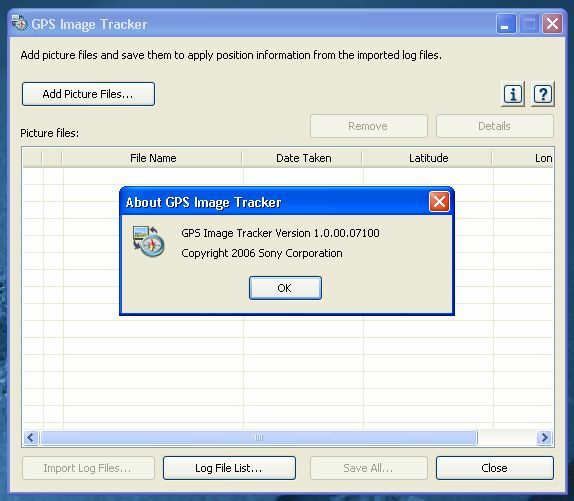 Is GPS Image Tracker new software, or just a Sony rebranding of some existing package? A: It appears to be new software, given its version 1.0 nature. 3. Is the GPS-CS1 outputting standard GPS data in standard formats - e.g. could you connect it as a USB device to any computer and get the data out, or will it only talk to the Sony software? A: The data is standard text file NMEA logs and you can connect the CS1 to any computer that supports USB (e.g. Mac, PC). UPDATE: I have only been able to get this to work in Windows; it doesn't show up on my Mac. ENDUPDATE When you plug it into USB it shows up like a regular USB drive. 4. If I don't have a Sony camera, could I still use the GPS-CS1 (and any bundled software) to geocode photos from e.g. my Canon PowerShot S70? 5. 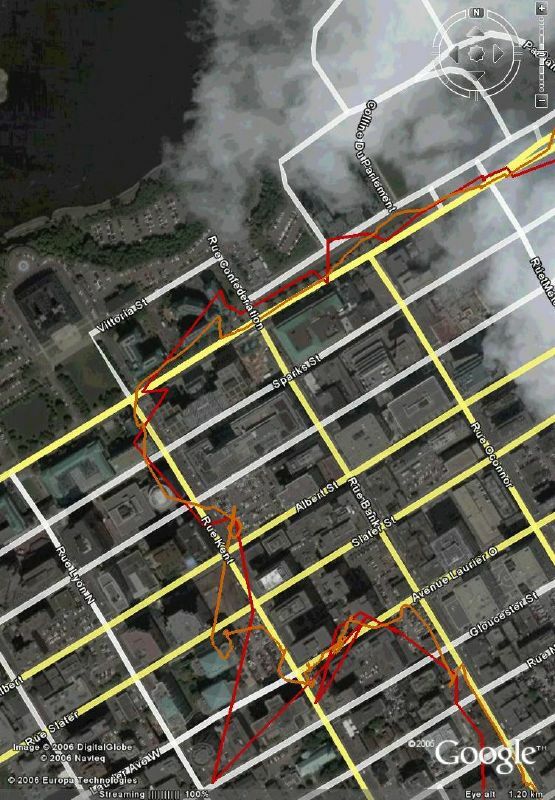 Conversely, could you use other GPS logs as the data source for photo geocoding in GPS Image Tracker? A: Yes, with some hacking. The Sony logs start with a line "@Sonygps/ver1.0/wgs-84". If it doesn't see that, it will say something like "unrecognized log file". But you can just use a text editor to add it onto any regular NMEA log file, then GPS Image Tracker will load it. 6. How does the GPS-CS1 / GPS Image Tracker bundle compare with other existing photo geocoding options? A: The hardware is good. The software is pretty weak. A: So far as I could find, only on the Japanese site at present. Neither US nor Canadian Sony support listed the GPS-CS1. Does it have to be powered on to read the files over USB? A: No. Just plug it in with the device power off - it works fine using the USB power from the computer. Lastly, you may be wondering about the GPS unit itself. At this point, I get way out of my expertise. The Sony is a 12 channel unit, it doesn't say what chipset it uses. As long as you're moving slowly (e.g. 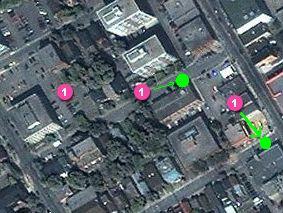 walking around), in good GPS conditions (e.g. unobstructed outdoors) I would guess you're going to be fine. I did some comparison tracks with my Holux GPSlim236, which is a 20 channel GPS receiver using the SIRFstarIII chipset (the most advanced chipset for consumer GPS I am aware of). I'm not going to give you the raw data, but as you can see from a screencap, the Holux (orange) fares slightly better than the Sony (red) in a downtown setting with midrise skyscrapers as I rode the bus to work. (Ideally, both should be tracking the street grid exactly, as the bus stayed on the road....) The Holux is recording a bit differently though - I was using Navio on an Axim, set to 10 seconds and 10 metre change, while the Sony only records at 15 second intervals. This last point may be an annoyance to hardware hackers, but a boon to those who love simplicity: as far as I can tell, you have no access to the Sony GPS hardware at all - that means no settings you can change, but also means no way for you to screw up the GPS settings. All in all, I find it a great tool - I turn it on, stick it in my backpack, and wander around taking photos, what could be simpler? Given the rather hopeless state of the current software, I bought RoboGEO instead. If you want more information about this topic in general, I have an entire web page on geocoding photos. The current version of RoboGEO (v4.4) will import the log files directly, but you need to rename them using a ".nmea" file extension, i.e. rename WG20060913210637.log to WG20060913210637.nmea. The next version will recognize "log" files as being NMEA. My experience is that this wonderfull device works as a USB key when plugged to a PC with linux. There's no compatibility problem. Then, you can process nmea log files with gpsbabel and do whatever you want with the gpx files. Man, that's a shame about the Mac compatibility: I've got a Mac, and I'd love something like this. Oh, and I believe the number in the filename is indeed the date/time, in ISO 8601 format, but with the punctuation and spaces removed. = 9:06:37 pm, Wednesday 13th September 2006. Mac compatibility is definitely a missing feature - I discovered it the hard way when I plugged it into my PowerBook. I think they must be doing some weird USB driver stuff; it's most unfortunate. I get a lot of hits from people looking to see if it works with the Mac. I would be curious to see how this would work under 'on-off' conditions -- switch it for an hour or so when I reach a location to register the locale, then switch it off to conserve batteries. The application I am interested in is for a 3 week trip in the bush. As long as the GPS can get a fix (which it will indicate through the LED display), I don't see why there would be any issues. How did you create the bus ride path overlay on Google maps? Did you manually create a KML file for Google Earth, or can you recommend a tool/procedure for converting the Sony log file to KML. GPS Visualizer has very powerful capabilities to do all kinds of manipulations on GPS tracks, including turning them into files to display in Google Earth. As a bonus, it's free. Is it possible to use any GPS unit (like a Garmin) along with the software like "GPS Image Tracker" in order to add EXIF data on the pic? I tried to go to the RoboGEO site to purchase, but no luck for two days. I'm only getting a blank page in response. Anyone else having problems reaching the site? Can someone upload a log file? It's basically a standard NMEA log file, with a custom Sony header. I'll grab a snippet and post it, if no one else beats me to it. Do anyone know why Sony so much data save? The GPGSV is not realy needed, without them the CS1 can be save double data. Do anyone like to see all the data in Google Earth, takte a look at my page (click on my name). I add some English for an easy start, but if you like i can make a complete english version. I can't figure out why your path in google earth is so erratic. I was in a car moving around 50km/h and the GPS-CS1 tracked my path almost perfectly with no sharp deviations which surprised me. The key is "in a downtown setting with midrise skyscrapers". My experience is that all GPS units lose exact path tracking in such environments. Does the GPS-CS1 record time as GPS time or UTC? Need to know in order to sync my camera time with the CS1. 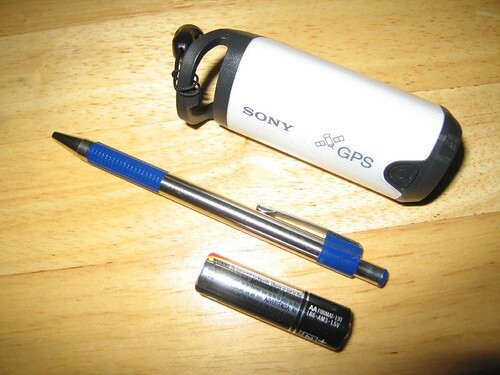 I have problems to get a GPS fix using the Sony GPS-CS1 datalogger. Sometimes when i turn it on, it keeps searching (the led display keeps double flashing) for a long time without success. This is very annoying. Today a took a walk downtown with the datalogger turned on, taking lots of photos with my Canon 350D. Later when i returned home and connected the CS1 using my USB adapter, there was simple no new logfile at all. The GPS couldn't fix during the whole tour...waste of time. I live in Malmö, Sweden. A rather small town without any "midrise scrapers" that should jam the GPS in any way. Does anyone else have expired the same problem when using the CS1? I try different positions of the CS-1. If he lie horizontal the results more worse. In vertical position, with the handle up, the results are ok. I ever have the CS-1 in a bag on top of my backpack and it works good there. After ~10 meters walking the recording of data starts. Why is the Image Tracker software asking for a time zone? I am back from a trip through multiple time zones. Am I supposed to enter my current (home) time zone or the time zones where the pictures where taken? The unit should have the local time zones, shouldn't it? Does anyone know how to get the correct GPS time? So that my sony camera time would be in sync with the GPS CS1 unit? But of course if you set your camera to UTC, you lose the information about the actual time the photo was taken. Note: I *assume* the GPS-CS1 is recording GPS time, it's using standard NMEA sentences. I very much doubt Sony would have converted it to exact UTC. I'm just trying to get the GPS image tracker program to work with a GPS log file which I created using GPSbable to convert my GPS track file from oziexplorer (.plt file) to nmea sentences. I don't get it working can anyone help me out on this. The first few lines look like this and do seem normal to me. the program accepts the new log file, but pictures taken at exactly same moments as some of the track points are not getting any gps info. pleae help, I like the picture motion browser to work also with the GPS info from my Garmin Etrex Vista. 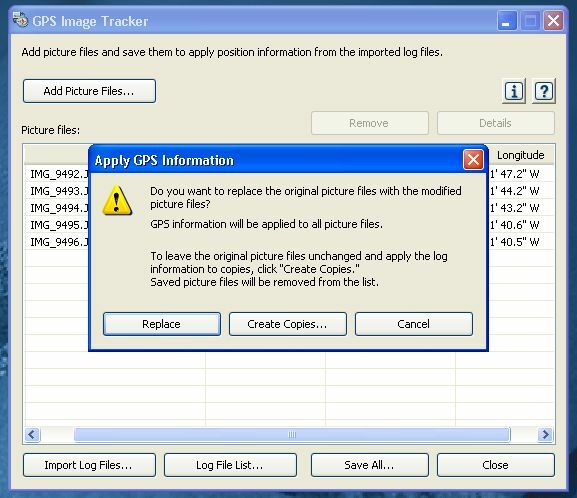 Do you need to physically install the GPS Image Tracker software onto the computer or can you run the program from a USB thumb drive or similar? For example, if you wanted to geocode your photos while you were at an Internet Café. I'm looking at this device for use while travelling when I won't have my own computer with me. I think GPS Image Tracker will run from a USB key - I will try it. If not, there are lots of other options to try e.g. RoboGEO - you don't have to use the Sony software, any software that reads Sony's NMEA logs and matches timestamps will work. I'm thinking of buying this unit because we are going to Alaska for 2 weeks and would like to have this capability. I found the article very interesting. I have a couple of questions: Do you know if it will work in Alaska? The time sinc issue is fuzzy to me, do I set my camera at home time and go or do I change the time in the camera for the time zone I'm in? I appreciate any replies. GPS will work anywhere in the world you have a clear view of the sky, so Alaska should be fine. I recommend just setting your camera to local time (Alaska), then you will know when you took your photos. To sync with the GPS data, it's a simple matter of entering the time offset - and if you're wrong it's usually pretty evident when you look at a map, so you can just correct the offset and recode the photos. All you really need to know, as long as you're taking photos in only one time zone, is the offset of that timezone from Greenwich / UTC time. I'm working on a web-application to "fix" gpslogs. So far it's able to move and delete points. Check it out! Do you know if this device is waterproof or at least spash-proof to some extent (or at least appears to be water protected)? I can't find any information. My plan is to use in on the boat. Thanks. It's not waterproof. Just put it in a small Ziploc bag or water tight plastic container. Thank you so much for this very informative article. I just saw this device in an appliance store with a lot of Sony cameras here in Thailand and have been trying to find as much info as I can. Your article is the best I have found and answered most of my questions. Again, thank you so much! Does anyone know if the GPS-CS1KA gets better accuracy than the GPS-CS1? Hey I just got the GPS-CS1KA (ordered through Amazon-->$118) after reading this site. Thanks Richard! I'm in the Philadelphia area, and I had it the GPS unit running while walking around the city. The GPS unit often has a hard time locating signal, especially near tall buildings. When the GPS unit loses signal it would interpolate from the previous and current known points, so some of the city results are pretty skewed or just inaccurate. It did a great job of interpolating the travel points when I ducked underground to take the subway. As Richard mentioned in his post (see above) there's a +/- 50 feet of accuracy, but for the most part... it's understandably accurate. 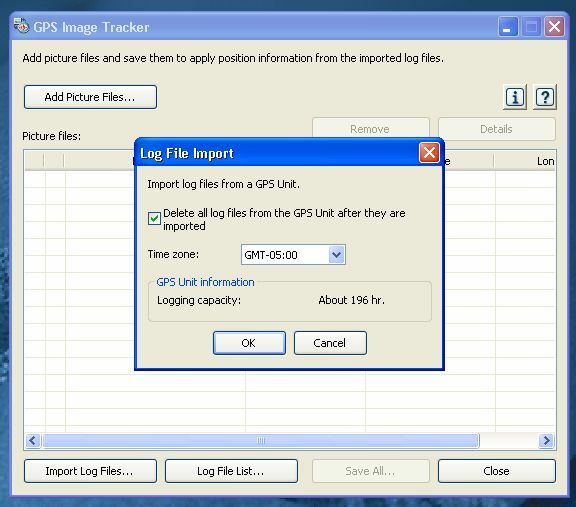 The default "log" file from the GPS unit cannot be used by Google Earth, but the "log" file can be converted (for FREE) to Google Earth's format using this site: http://www.gpsvisualizer.com/convert. Does anyone know how to convert more than 6 log files using GPS Visualizer? I have way more than 6 log files for 1 trip and I can't figure out how to put tham all into 1 kml file. If not, is there an easy way to do it? I have been using the sony GPS for 6 months now, it will record very well on open terrain. But for medium and high rise build up area it might not track at all. I came back from HongKong last week and in the city there was nothing log while I was taking a ferry to Lama Island, it could record the path from the ferry terminal all the way to including a tracking path along the island's walking path. 1) the memory will fill up (at which point an LED will light to let you know) but it WILL NOT delete stored data when full. You have to manually reset the device if you want to clear it. So no worries about data loss. 2) You can easily drag and drop the contents of the Sony CS1 to a memory key or portable hard drive; the Sony files are just like regular text files. So e.g. if you filled the CS1, you could go to a cafe and move all the files off to a portable drive, then either delete them from the CS1 using the computer (just like you would delete files on any external storage) or do a manual reset/erase of the CS1. I can confirm that the Sony doesn't mount on a Mac PPC 10.4.10 system either. Works OK on an Intel 10.4.10 Mac, as well as on Vista. Didn't try XP, but wouldn't expect any problems. I'm the developer of ImageIngester, which is a photo ingester (same category as the better-known Downloader Pro) that can automatically geotag photos it ingests. ... ImageIngester has both free and [pay] versions, and the GPS features will be in the free version. Works find on my MacBook Pro with OS X 10.4.10. Mounts as a USB drive click on the GPS folder and open the .log file. Does anyone know where I can get Picture Motion Browser software. I realise the new GPS kit comes with the software, however, I have the first version of the GPS which only supports Sony cameras. I would like to hear anyone's feedback. I had one of these, but lost it the other day walking down The Strip in Las Vegas. It was clipped to the outside of my camera bag with the included carabiner, and somewhere along the way it unclipped itself and fell off. I wasn't doing anything overly active or strenuous, just walking. So this is my caution to you to not rely soley on that carabiner. When I get my next one, I plan on using some small diameter rock climbing cord to attach it to a locking carabiner. Other than the shoddy attachment hardware, I love this thing. Yes!!!! There is a way to get the info out of the CS1 WITHOUT using a PC! I bought thid think called a USB Link Bridge that transfers data from the CS1 to a USB stick and then you just plug the stick into ya iMac, MacBook, etc etc! and it works!! 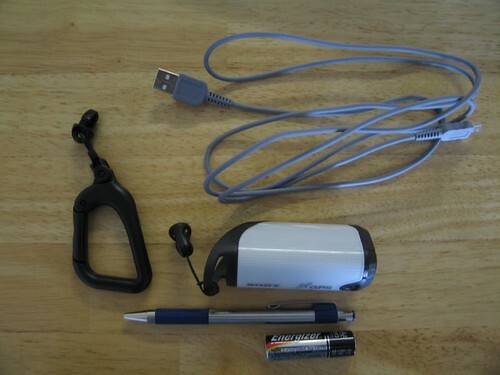 It also works with digital cameras, other flash sticks, portable hard drives etc etc. No more mucking around with a PC! Yes!!!!! I just ordered a GPS-CS1 because of the good feedback from this article. I am going to Rome soon and had hoped to set my time to the Roman local time. Can this unit be sync-ed? I will test it here in AZ by presetting the date/time. I assume it is GMT+1. on GPS time, it's a universal time that has no timezones. photos. There's more information in my posting "about time".